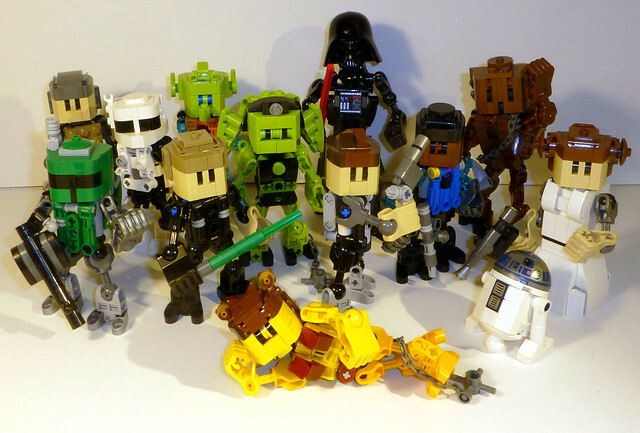 I was chatting with Swert the other day and somehow we started talking about Matoran designs, so despite everything else I really need to do, I designed and built these. Anyway, I've spent the last couple of months building MOCs, and now it's time to get them ready for the BricksCascade convention next weekend. Sooooo picture time! So this is what I've been building for the last couple of days. (Helped that Andrew sent me back some of my older mosaic plates, because I really needed to steal some pieces from them.) This is a scene from the Skybound season where Jay and Nya get back together at the end of it, which is one of my favorite scenes. However, the background in the screenshot was meh, so I swapped it out for a more unique skyscape shot of Ninjago City, including Borg Tower. As for interesting techniques used here, I used some SNOT designs to get the eyes and mouths right on their faces. 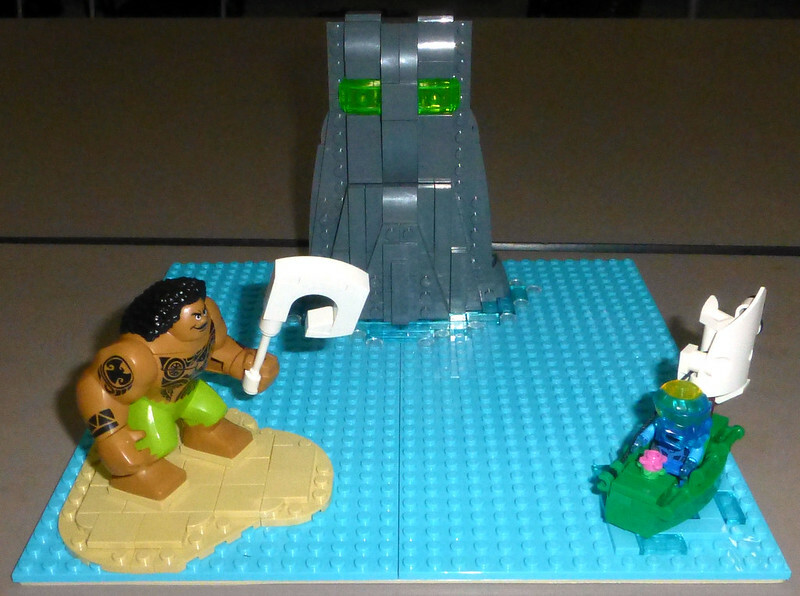 Plus, while the characters are made using bricks, the background is made using plates, which add some depth to the image. (The white wind circle is actually two plates tall.) The most challenging part of this was the medium azure background; I was able to fill in a lot with larger plates, but getting all the corners filled in took some effort and whipped out my supply of 1x2 and 1x4 plates in the color. Anyway, I'm pleased with how it turned out, and it'll show up at Bricks Cascade in 2018. Probably won't sent it on he BioniLug circuit, since it's not quite Bionicle related, but I haven't seen too many Ninjago mosaics so maybe this'll stand out. So after building a mini Boba Fett, I started to wonder if I could scale any other classic characters down... and then I went a little crazy until I pretty much ran out of the essential pieces to make any more. (From left to right, back to front) Tarkin, Stormtrooper, Greedo, Oola, Vader, Lando, Chewbacca \ C3P0, Boba Fett, Luke, Han, R2D2, Leia, Slave Leia. The body dimensions are 3x3x4, comprised of mainly technic, although some of them have custom builds. The arms and legs all use the short CCBS limb element. The heads are curved bricks build around a 2x2 head, three studs tall minimum... just in case anybody else wants to make more at this scale. I like how most of the characters turned out. The Stormtrooper is a bit off... might be better as a Scout. Greedo is a pain, mostly because I decided to make him lime green because that was the best color I had to build in, but the bright color and shape just don't look right. And of course, Vader... I could not figure out a head design for him, so I tried to build for his CCBS head mold. It... doesn't quite work. Maybe it would be better if he had a cape. I wanted to make a few others from the original trilogy, like Obi-Wan and Yoda, but ran out of time and pieces. (The ones I ran out of were fists, those CCBS limb pieces, thru ball joints, and tan / brown curved sloped. The big CCBS hip piece, which is generally rare, is actually not a problem for me since I've been obsessively ordering those for the last year and have a big collection now, they're rather nice for mini builds this size.) This are currently in a box ready to ship out to BrickFair, so hopefully they'll be on display there. 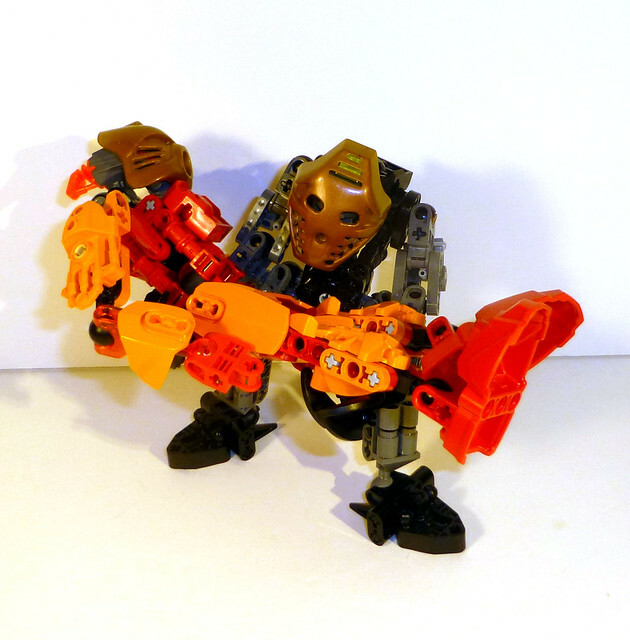 Look at me, I made a MOC! Since the CCBS characters came out, I've been wanting to build a to-scale ship for some of them. Lego's finally doing it with the speeder bike this summer, but that's a pretty small vehicle; I want a huge TIE Fighter and a massive XWing piloted by Vader and Poe, or something like that. The idea is doable, but a bit out of my price range at the moment. When this contest rolled around, I thought it would be a good opportunity to do this scaled down. My first thought was to make a TIE fighter. I'd build a frame for the wings out of CCBS bone pieces and then fill it out with HF shells and other black panels. (And I guess try to avoid using too many plates and stuff, 'cause system.) But then I'd have to also design a cockpit that could hold a CCBS character. The only one I have that would fit would be Vader, so I thought I'd shrink him down, but then I didn't have access to the parts I needed and I didn't have enough panels or shells and it looked like this idea was going to flop. Then on a whim I tried to design a mini Boba Fett, thinking that his ship would be a bit easier to make. It works out because Slave I has a lot of dark green and dark red in it (well, the official sets do) and those are colors that are abundant in Bionicle elements. For Boba, I had good success with a small head made system bricks. Since I didn't have the technic pieces in sand green or sand blue, I decided to stick with gray and green based off the classic minifig design. His body is a condensed block of technic elements that kinda worked out, but overall he didn't exceed the 25/75 system to technic ratio, so I knew if I wanted to enter him, he'd have to come with a ship. I'm fairly pleased with how Slave 1 turned out. It's stable and can stand on it's own... although the bottom / back is exposed and a bit messy, but that's rarely going to be on the display side. The red section is not quite as solid or shapely as the real thing, but it has a certain "Bionicle" flavor to it IMO, and it's still recognizable. The green hull went together well, and I'm pleased with how the cockpit came together; Boba can sit fairly comfortably inside it. Plus, I made a small "Han in Carbonate" bit... I realize it's not quite to scale, but it does fit inside the hull. (However, there's no opening door... I kind of have to dismantle part of the hull to squeeze the carbonate block inside.) Anyway, it's fairly swooshable (I mean, it's big, and doesn't have the best grip, but it doesn't fall apart when swooshed, so that counts, right?) Plus, the wings and weapons rotate, so it can go from horizontal parked mode to vertical flying mode with ease. But anyway, that's the most custom building I've done since BricksCascade. So yay, entering another BBC Contest. 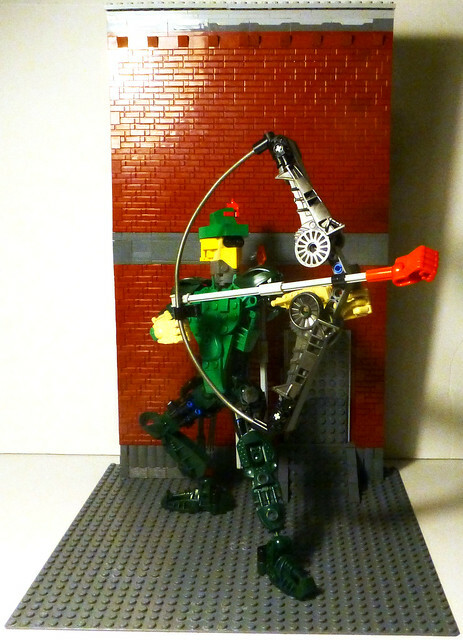 Lookie at me, I made a Bionicle MOC! It's been a while. So this will fit with the BZPower colab of Super Hero characters, and I got it finished in time for BricksCascade next month. The system to technic ratio would probably put it over the limit for any BBC contests, but that's not an issue at conventions. 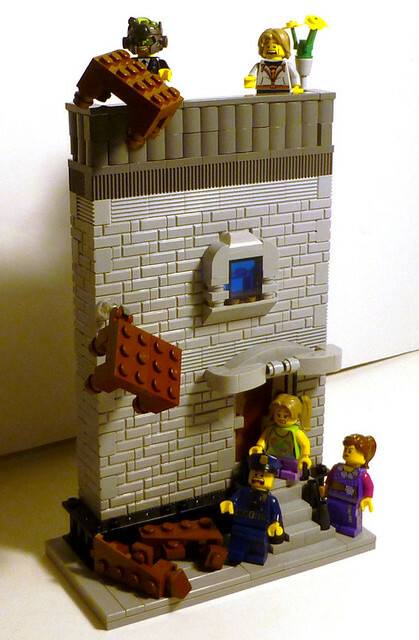 Plus, the simple building façade makes use of most of my dark red masonry bricks, so yay that. 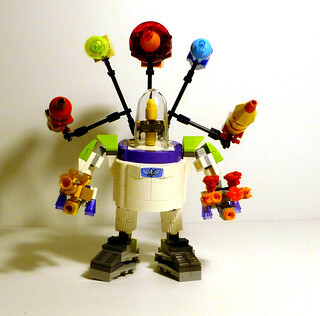 Everybody should know Buzz Lightyear from Toy Story. But there was also a cartoon show that ran in 2000 that followed his adventures as a Space Ranger. These designs are based on characters from that show. 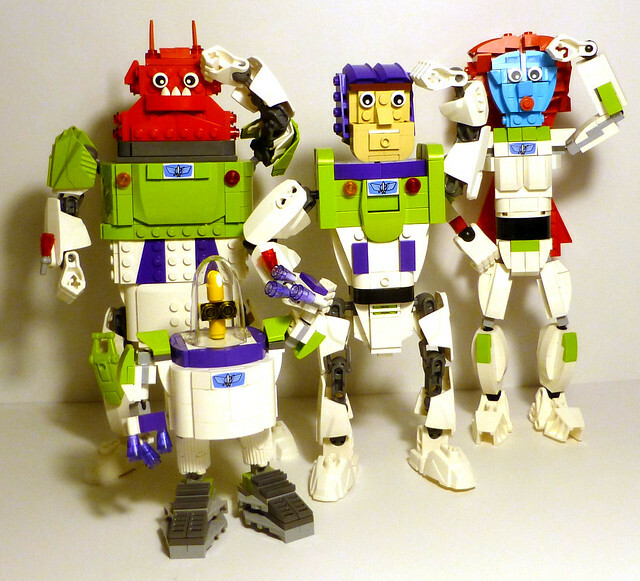 From left to right: Booster, XR, Buzz Lightyear, Mira Nova. I like each one well enough on their own, although I'll admit there are some flaws, and their proportions to each other are a bit off. (Mira is a bit too large, Booster is on the small side.) XR's helmet is also too small, but the new Ninjago dome just works too well, and none of the other Lego domes are tall enough. More detailed photos are here. These should be at BricksCascade next month... and probably every other convention I go to in the next year... What's funny is I have like two other projects that I could be building for, but I got inspiration for this lot and worked on them instead. The Cyber Criminal "Terabyte" terrorizing the public. Little Bobby has finally snapped. What would Mrs. Roberts think? So, like, for real this time. 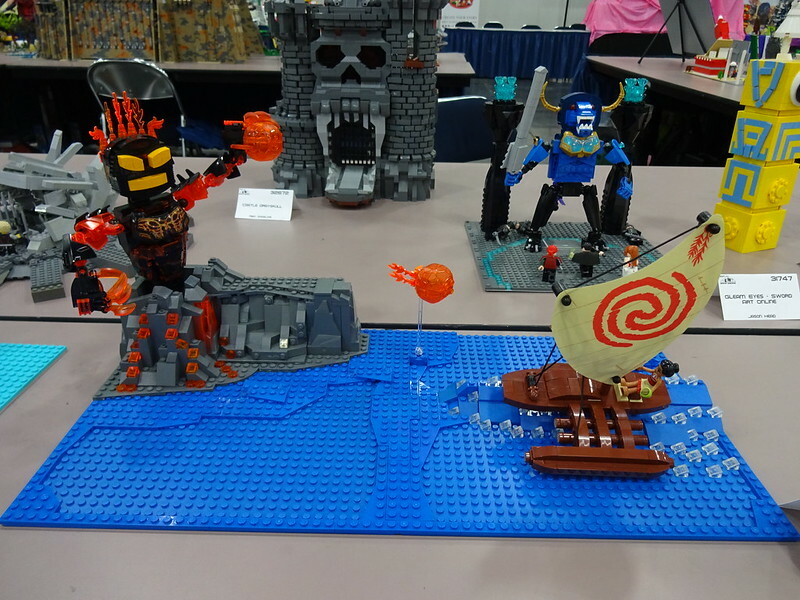 Hey folks, I think it's time we start planning for a BZPower Bionicle 2016 Mosaic that can grace the various conventions. To start out with, let's finalize an idea. I'm thinking that the best idea is to utilize images from the comics that come with the 2016 sets. The best images to use, IMO, would be the Uniter images of the Toa and Creature combinations. Each comic has a straight-on image of the Uniter character, which would be easy to mosaic-fy. Still, we would need to select which one. Gali, Lewa, and Tahu would be some of the more colorful choices, but we could do any of the six, depending on what colors people would want to contribute more of. (FYI, gold would probably be portrayed by yellow.) However, there's also potential to do Umarak the Hunter. He seems to be the best model out of the bunch, and it would be a first for us to show off a villain rather than a Toa. Thoughts? Size-wise, I would aim for a 3x3 mosaic, so we would need 9 contributors of 32x32 baseplates. I could maybe build half of it, depending on what design we go with, but the more the merrier. If there's enough interest we could attempt a 3x4, which we pulled off last year, even if there were some stability issues at a few conventions. I got a bunch of engraved bricks done this year and handed em out to everybody who participated on the Gali Masters Mosaic. But I have plenty of leftovers to anybody willing to ship in a mosaic baseplate again this year. So let me know if you'd be interested in participating and what design you would like to use. 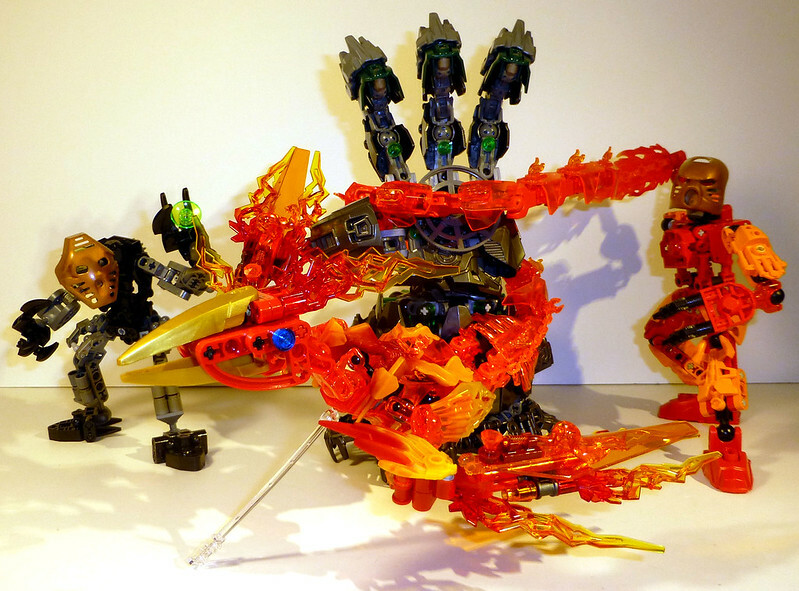 To get an idea of what we've done in the past, here is Bionicle Collaborative Mosaics: A History.